There are two kinds of people in this world- a summer person and a winter person. And if you’re the latter, it is your time to rejoice human! Winter is mostly about clothes if not anything else. From layering to baggy sweaters to trench coats to cardigans to thigh high boots, winters are not so blue if you think about it. There are a lot of options and trends to choose from now. These are some of the highlights from the Fall-Winter Collection by Tjori. We decided to give the classic American Trench an Indian twist. 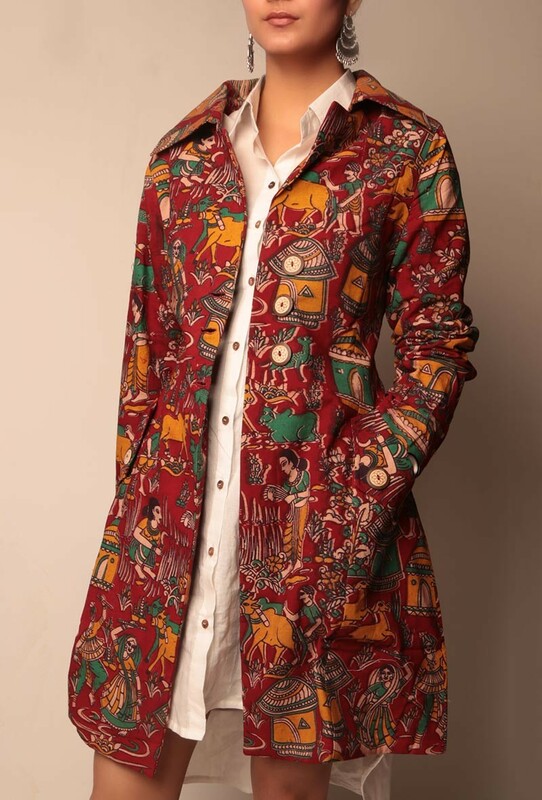 The standard trench coat gets a taste of our time-honored Indian art forms. With the silhouette of a classic trench coat, this piece has a vibrant print of the traditional Kalamkari, native to Andhra Pradesh. This piece is designed with functional pockets and embellished with wooden buttons. Throw it over a simple shirt dress for a subtle office or brunch look with classic beige heels. This trench in the Bagru print (from Rajasthan) has a vintage vibe to it. This piece is perfect if you want to experiment or try something out of your comfort zone. It’s quirk appeal will definitely be an icebreaker and is sure to make heads turn. This comes too with pockets and wooden buttons. A silk trench coat with Ajrakh print. Probably something you never thought you’d see or hear. But our creatively driven minds led us to this masterpiece. The Ajrakh is native to cotton but we gave it a twist. This silk trench comes with a belt. It is your quick fix for a glam outfit and will be perfect for a night party too! If you’re oblivious to the warmth and comfort of the Pashmina, you’ve definitely been living under a rock! With the intricate Kani embroidery (born in the Kanihama district of Kashmir), this piece brings with it nostalgia and the feel of nature surrounding you while also keeping your warm and cozy. Our Pashmina collection was designed very carefully keeping in mind the fitting use of motifs, designs and the overall feel of the ensemble that would transport anybody’s mind to the valleys and gardens of Kashmir. The set of three accommodates a semi-pashmina threaded kurta, palazzo and pashmina shawl. It’s a perfect and well-thought assortment for a perfect outing or a dinner party. Or if you’re the kind of person who likes to go subtle and wants to seem like they haven’t made a lot of effort, you could explore the wide range of Pashmina kurtas we have to offer. Wear them over jeans for a quirky look while also keeping warm in the chilly weather. You could also throw a woolen scarf around your neck for a more refined look. Our Pashmina Kurtas are neatly and hand embroidered with Zari embroidery that lends an opulent look to the apparel. Apart from these, there is a wide array of winter apparel which you can choose from. Explore what catches your eye, try out something you’ve never tried before, mix and match but most importantly keep yourself warm!